Terry is one of our opticians. She has been helping people pick out the perfect frames and lenses for 23 years. 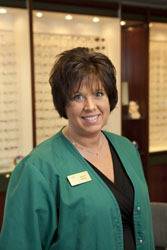 Not only is she great at picking out frames for you, she is also highly experienced in adjusting and repairing glasses. Terry lives in downtown Bald Eagle with her husband Mike and their two dogs.